Reading Yvonne Farrell and Shelley McNamara’s FREESPACE Manifesto for the Venice Architecture Biennale 2018, we are overwhelmed by the wide range of definitions of free space. FREESPACE describes a generosity of spirit and a sense of humanity […]. 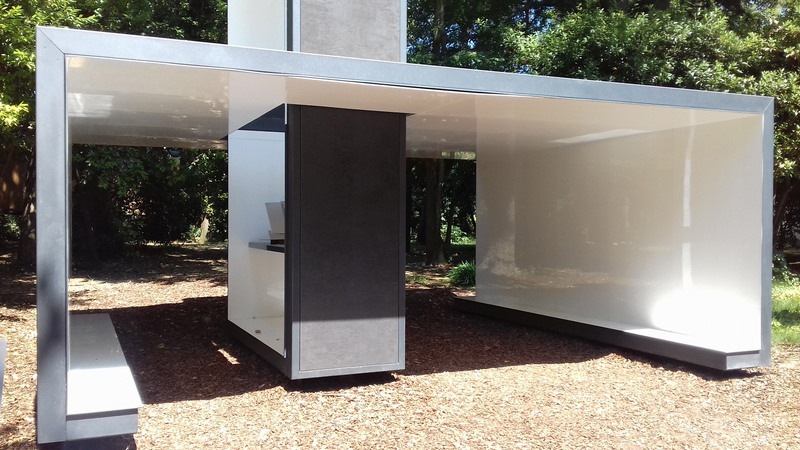 FREESPACE focuses on architecture’s ability to provide free and additional spatial gifts […]. FREESPACE celebrates architecture’s capacity to find additional and unexpected generosity in each project […]. FREESPACE provides the opportunity to emphasize nature’s free gifts […]. FREESPACE encourages reviewing […] new ways of seeing the world […]. FREESPACE can be a space for opportunity, a democratic space, un-programmed and free for uses not yet conceived […]. .
“Free” is the space that architects should design and “free” is the attitude that architects should adopt to design that “space.” However, what impressed us the most in the manifesto definitions is the recurrence of the word “generosity,” used to explain possibilities within FREESPACE. Understanding FREESPACE as generous space designed by generous architects led us to an utterly new reading of the exhibit. This year Biennale faces the antithesis of the challenge discussed by Gregotti and Ungers. The question is not anymore if unity will lead to a European architecture, or to a global architecture in a more current fashion. The question is what kind of architecture exists within an emerging pattern of dis-unity. In a world where the paradigm of equality has led to boundaries and confinements, enclosures and bans, our lens of interpretation is to discover if the architecture proposed by this year’s Biennale shows the horizon of a new architecture. Through the notes that follow, we wish to introduce you to six national pavilions/participations that represent the re-definition of architectural identity, from its authoritative role, with generosity. The result of such an investigation is an exploration of FREESPACE that brings us to question the meaning of contemporary citizenship. 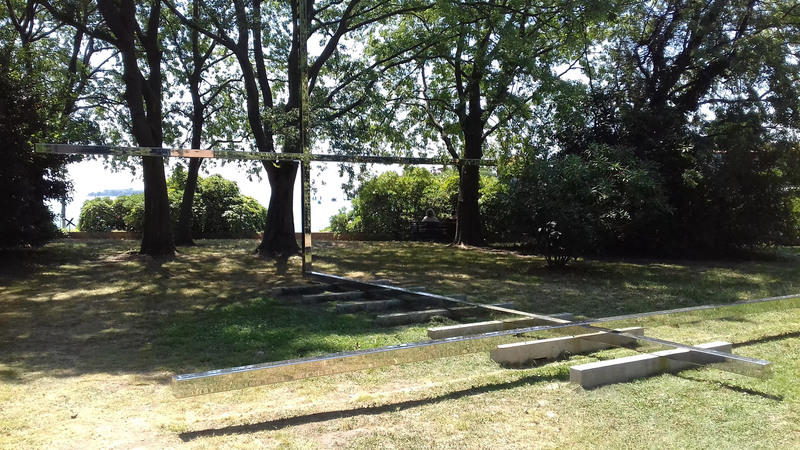 Mario Cucinella, the curator of this year Italian participation, decided to call the installation “Arcipelago Italia” and laid it out as a system of scattered Italian islands. Arcipelago Italia is an analogy for the system of peripheries that we can find everywhere in Italy, from North to South. The pavilion depicts rural and suburban identities of a country that has forgotten its roots of countryside and its ties with the agricultural world. 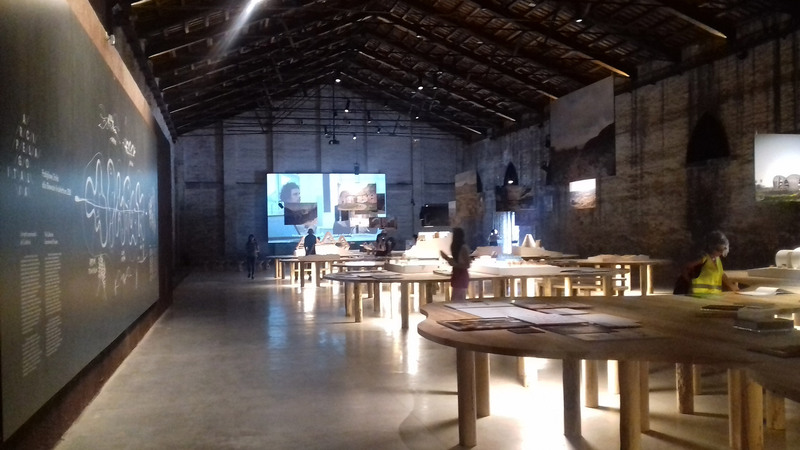 The exhibit is organized as an archipelago, an agglomeration of five projects for five case studies that share the common goal of displaying architecture as a territorial activator. The first room is occupied by a self-promulgation from the curator that brings us to discover the five sites of interventions. In the second room, you can find the display of the five projects designed by six emergent Italian architectural firms: Diverserighestudio, MoDus Architects, BDRbureau, GravalosDiMonte Arquitectos, AM3 Architetti Associati, and solinas serra arquitectos. The projects are presented on top of a massive wooden table occupying and invading the room with a pungent oak odor (Fig. 1). The “space” suggested by these interventions are spaces for reactivation of communities, often implying participatory design techniques (Fig. 2). If architecture wants to be the territory maker, then its autonomy has been achieved through this interpretation of FREESPACE, a space where the designers can offer specialized solutions from their higher role of space makers. However, the lack of connectivity among the projects reveals an idea of “space” that is fragmented. If Italy is an archipelago, are we considering keeping it as an ensemble of separated parts? Perhaps, this is the intended message, and perhaps these fragments represent the idea of “diversity within a whole” as advocated by Ungers. We would just have preferred Cucinella to openly state it, and perhaps give credits to the other six teams collaborating in the making of this installation. Arcipelago Italia: vast open space revealing the richness and potentiality of the Italian (rural) territories. GravalosDiMonte Arquitectos’ proposal for the Scalo di Grassano, aiming at creating a synergistic network of locations sharing services and generating flows. The Holy See invited ten architects (ten is a sacred number in Catholicism) recognized worldwide for their work, “from different religions, cultures, and nations,” 8 and charged to re-interpret Asplund’s metaphor, designing ten chapels nestled in the luscious garden of the San Giorgio monastery. Strolling around the garden, the labyrinth of life makes one encounters the chapels as surprises that reveal themselves as follies popping out from behind a tree or rising in front of the lagoon. Each one is stylistically different from the other. This pilgrimage between the different sacred places is a call to unity within diversity, leading to a “space” that is “free” because it is in between these two conditions. In this light, the path that leads from one chapel to the next is as important as the chapels themselves. Although the architects were asked to include an altar and a pulpit in each chapel, the cross becomes the most recognizable element of most structures. Carla Juacaba’s chapel develops itself around the steel cross (Fig. 3) that grows into a symbolic center. Working with plans and projections, the cross became the bench that spiritually connects to the environment all around. Smiljan Radic Clarke puts the cross at the center of his design as well. In his case, the cross is the structural element that supports the roof, a circular skylight that connects the cross to the sky (Fig. 4). Norman Foster decided to tailor his chapel around the trees and bushes of the garden, opening the chapel to view the lagoon (Fig. 5). Here, three wooden crosses support the whole cladded wooden system, carrying out the rhythm of the structure. Francesco Cellini recreates the cross with the section profile (Fig. 6). Finally, with a similar intention, Sean Godsell designed a cross plan that encapsulates and reflects the light inside a golden tower (Fig. 7). These structures might remain permanently for the Biennale, probably changing the current function into something different such as galleries or even shops. Some of them, perhaps, will be moved to another location, maybe serving a community that is looking for a new “spiritual space.” We hope that the Holy See will pursue this second path. The generosity of giving the chapels to other communities would be an excellent way of recycling, while maintaining the typology. 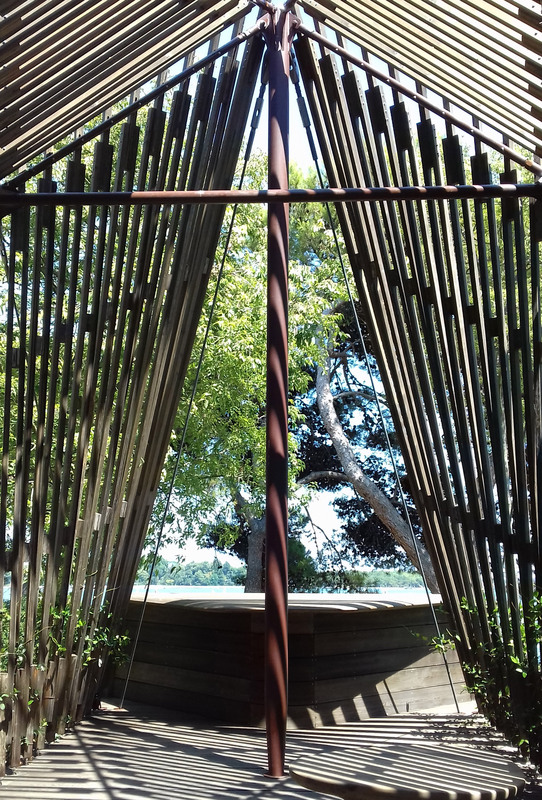 Holy See: the squared section beams of the cross, are enclosed by sky, water and trees, which provide the backdrop for Carla Juaçaba’s chapel. 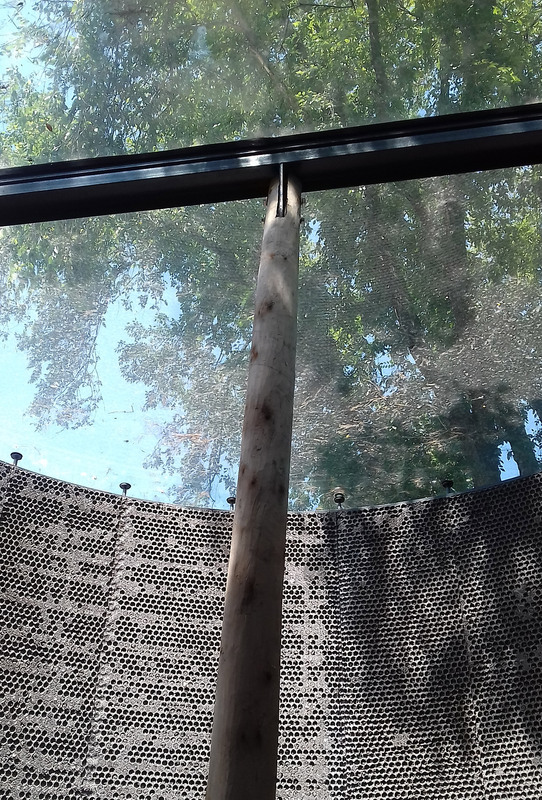 Smiljan Radic Clarke’s cross-sectional suspended cylinder is structurally supported by its own cross. Norman Foster’s timber structure, framing views out to the sea. Francesco Cellini works with elementary and pared down spaces, materials that are practically abstract. Sean Godsell’s resilient and transportable chapel is a tall, rectilinear structure formed around a square plan and based on the dimensions of a shipping container. Estonia and its installation bring to Venice a controversial interpretation of monumentality, one which challenges the static and universal authorities, and critiques the interchangeable values that make the monuments “dancing” from one political side to the other.9 What sets the monuments apart from other types of architecture is this dichotomy to be political, while being representationally simple.10 This characteristic made the monument a tool at the service of imposed regulations, providing the experience of a specific place to its users. 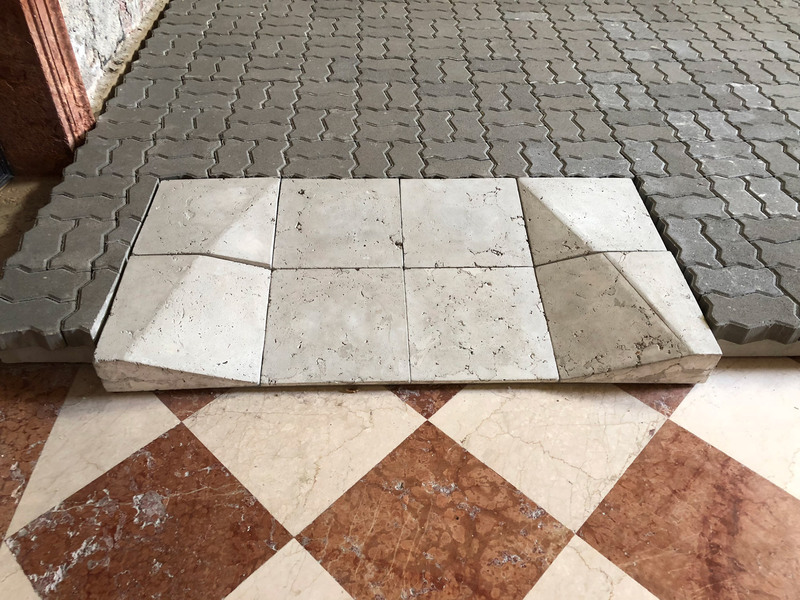 Weak Monument, floor detail: existing bi-colored polished marble floor superimposed by a risen cobble stone plaza accessible via an elegant white marble ramp. A sense of “release” and freedom transpires when comparing the two sides of the heavy wall. On the front side, visitors are welcomed by a “naked,” sober, almost sanitized “free” plain (Fig. 9). On the other side of the concrete wall, an urban situation is recreated. From here, one can access a loud, crowded “space” built up by objectry (Fig. 10). 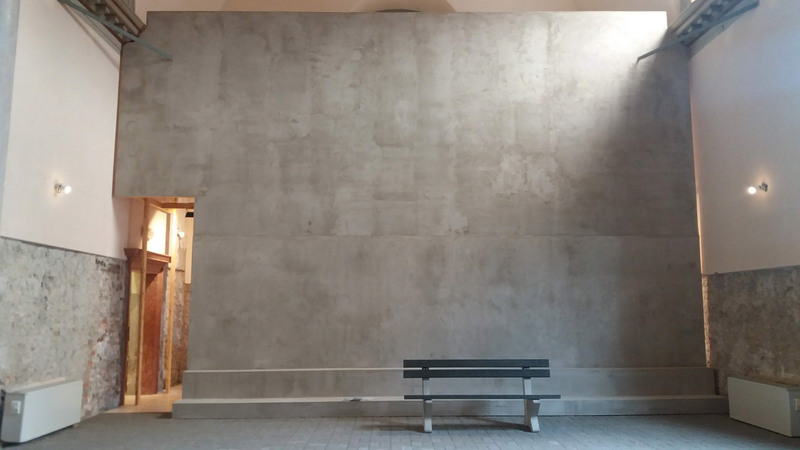 Free plain unfinished concrete wall defining two interior spaces. In-between space accommodating a rest-niche within the existing structure of Santa Maria Ausiliatrice Church and separating two very distinct atmospheres. Monuments relate people to everyday histories of building and living and make them part of tradition. 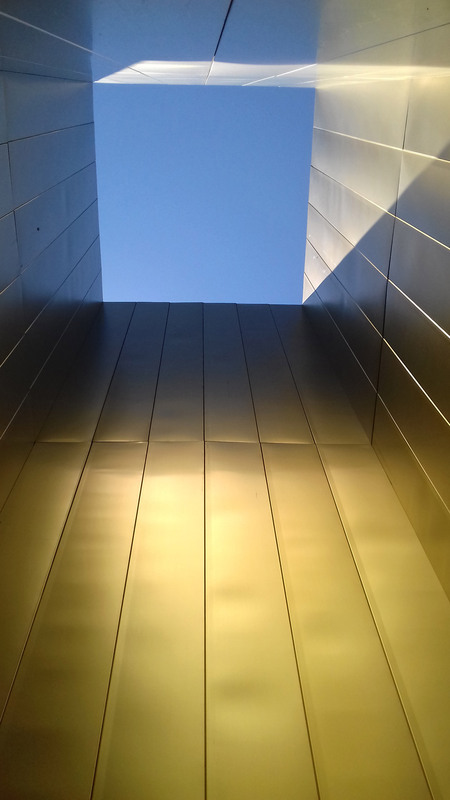 The monument allows citizens to establish an immediate and tangible experience that has meaning for many and thus receives the status of a monument. In this case, it might be that curators Laura Linsi, Roland Reemaa and Tadeáš Říha are exploring the possibility to “free” information and allow for new, more contemporary memory. This freedom might be also achieved by questioning the possibility for a monument to be “temporary” or/and “mediocre” and, because “its potential reside in its physical form,” 16 the act of conceiving pavilions might want to suggest designers to be bold in liberating the new from the old and design a space in which citizens can equally identify with today. Perhaps, this is the only way to free space and to provide an opportunity for citizens to re-write their own identity and sense of space. What is Swiss Design and how does it relate to “space” and its utility to Western Citizens’ comfort and equity? Often referred to as the International Typographic Style, the style of design elaborated in Switzerland in the 40s and 50s was a spin-off of much of the graphic design generated in the mid-twentieth Century at the Zurich School of Arts and at the Basel School of Design. The style favored simplicity, legibility and objectivity. Central to this style was the use of sans-serif typography, grids and asymmetrical layouts that, in the combination of typography and photography as means of visual communication, were presented to the world as posters, clear images easy to be understood. “Svizzera 2014: House Tour” invites its visitor to explore standard homes in an a-contextual setting. Nothing is measurable: the classical references between the body and the world are questioned and resettled. Furthermore, from a material standpoint, all is the same, washed-out from any attempt to innovate and think of a less aggressive use of materials with less impact on the environment. White walls, plastic window frames, wooden floors, etc., all is very familiar to us, all is sanitized, all is lacking the necessary critical attention to the environment and citizenship. 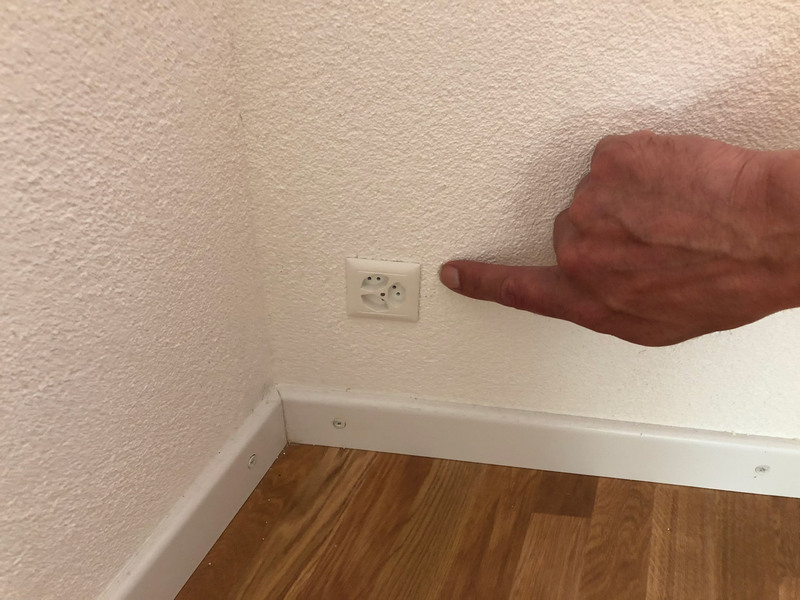 The call, from the conventional uncritical user requesting a standardized environment in a desperate desire for comfort living, has been answered. Following the traditional Swiss Design, Alessandro Bosshard, Li Tavor, Matthew van der Ploeg and Ani Vihervaara, who received the Golden Lion for best national participation at this Biennale, offer us a poster of how a domestic “Western space” should be like, through a simple, legible and objective architecture (Figs. 11, 12). To us, therefore, the question is: What is the space really freeing citizens from? Perhaps, it liberates us from conventions, stereotypes and strict rules that we have been adopting for centuries to uniformly perform within this society. 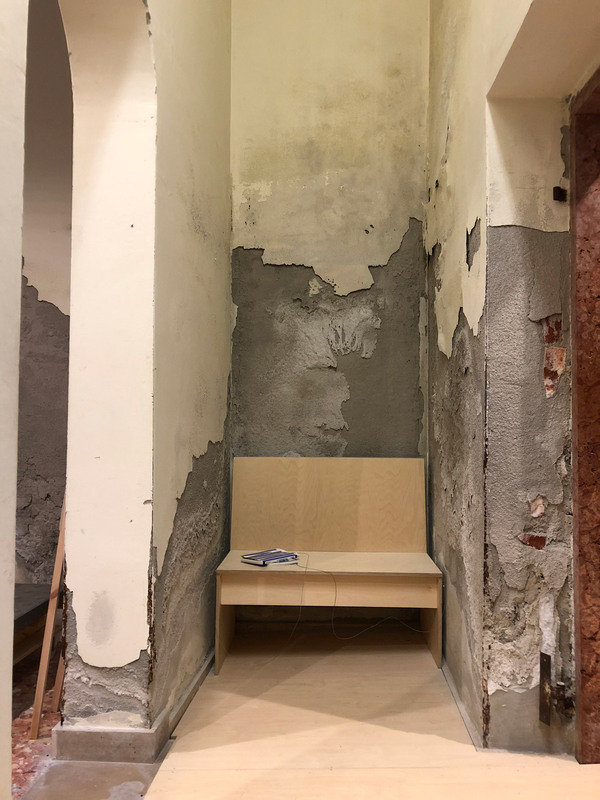 This “space” makes us question our discipline and whether we are using what we know wisely when designing or whether, on the contrary, we have been imposed standards in order to conform our work to the great masses. When visiting the pavilion, we start questioning about an ever-changing world and how, if compared to it, design results static and stubborn to transformations: the world we live in today has never been more various and diverse. Citizens are going through an important metamorphosis where questioning the sacred and traditional family core is in order. We the designers ought to think of spaces able to provide for a multitude of diverse demands. It is time we re-question our (imposed) standards. Svizzera 240: House Tour: the proposal of an “out-of-scale” conventional home. The invitation for the visitor to play with ever changing scales in space. When entering the USA pavilion, the visitor is guided through an immersive experience of informative facts that explore the idea of citizenship in seven different scales: Citizen, Civitas, Region Nation, Globe, Network and Cosmos (Fig. 13). The aim is to engage the audience to start considering citizenship “from body to city to heavens,” 19 culminating in the realization that citizenship should be understood and addressed as a cross-boundary critical global topic. The choice of the seven spatial scales enlarges the horizon of citizenship to the controversial and paradoxical sphere of the sky and beyond. In 1949, the German-born American philosopher Hannah Arendt saw in the conquest of the cosmos, the reduction of the humans’ citizenship depriving them from authority.20 On the opposite end, this pavilion considers citizenship as a system of rhizomatic networks of ecology, culture, and policies. In this latter interpretation, humans are only a part of the whole, yet the only responsible for its destruction. Dimensions of Citizenship: with its various individuals’ installations, it explores the notion of diverse ideas of citizenship. The British pavilion brings together themes of isolation, drifting, Brexit, and, perhaps in a subtler way, it conveys the decay of the collective idea of the United Kingdom, a nation distancing from the world and perhaps from itself. The pavilion looks abandoned and consists of a series of empty galleries (Fig. 14), where the visitor is free to choose the route to take, to explore the emptiness and the void: this is the exhibition in its traditional space. The openness of the galleries represents the generosity of space, free for all, open to any interpretation and to the visitor’s ideas and thoughts. A place not only for discussion and performance, as the organizers point out, but also for contemplation and reflection on the current state of affairs of the UK - and of the world. However, the British pavilion elaborates another gallery space, less traditional, that takes the visitors by surprise. 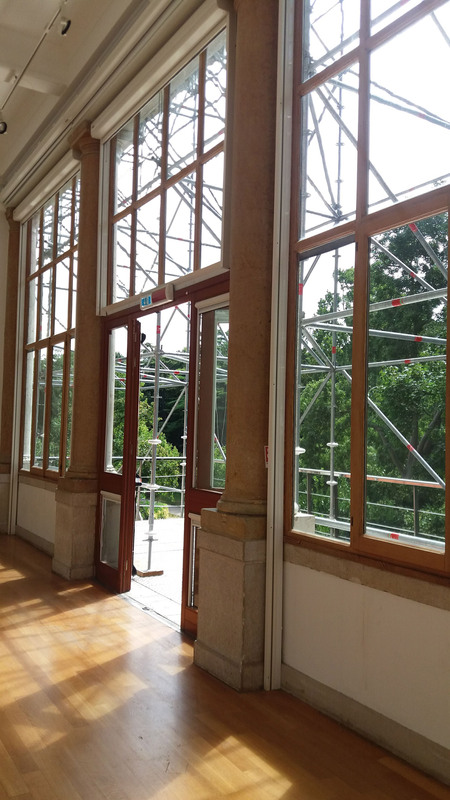 A terrace is spatially constructed on a system of scaffolding covering the empty shell of the pavilion (Fig. 15). 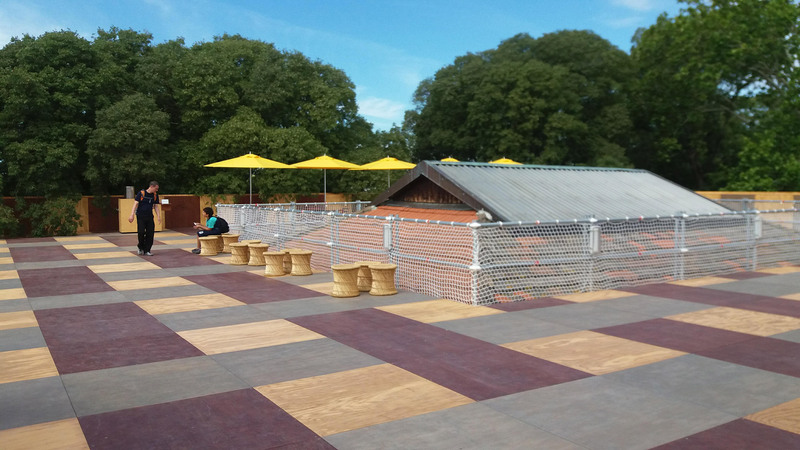 This raised platform is accessible through an outdoor staircase built adjacent to the main existing entrance of the pavilion. To the organizers, it is a structure that supposedly creates a sense of reconstruction and restoration. Nonetheless, it is also a construction on the ashes of what used to be, looking over the Laguna from top-down: is this a new sort of colonialism? Similarly, the theme for the British pavilion resonates with the theme of the American one: the issue of borders, strong nationalism, and their place in the world. Yet we ask: Abandonment of what? Perhaps of outdated notions of belonging? Or, perhaps, of ideas of power and dominance? A platform towards where? New ideas of belonging, and, perhaps freedom, the reinvention of what it means to be British? Certainly, less academic than the American pavilion with its artistic and dynamic installations, the “empty” British Pavilion invites the public to engage in such inquiries, to start a critical analysis, to explore for oneself an answer to the dramatic emptiness, “free” of obvious meaning and full of possibilities for interpretation. Island: the interior space offers no exhibition. The building, covered with scaffolding, supports a wooden platform at roof-level. After wandering amongst these six pavilions/participations, do we have a response to our initial question: What kind of architecture exists within an emerging pattern of dis-unity? Clearly, the British and the American pavilions represent an interpretation of FREESPACE that more than others are tailored within spatial and current ideas of borders and enclosure. 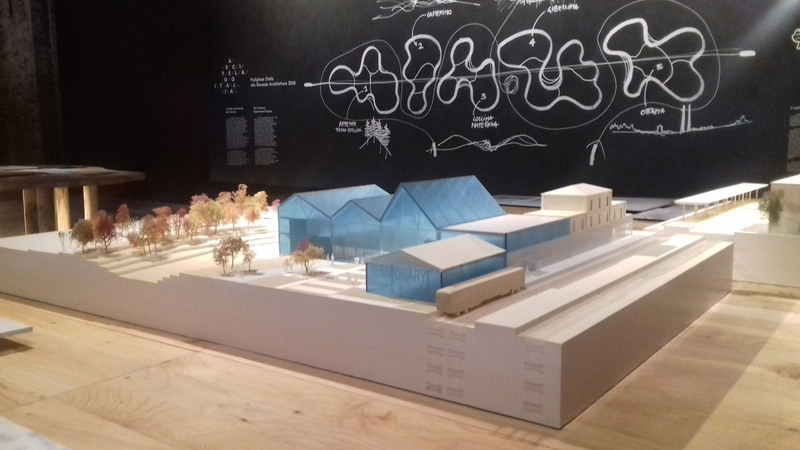 But whereas the British pavilion constructs its FREESPACE on top of the ashes of a deceased past, the USA one presents a connectivity system that wishes to unify the diverse scales of citizenship, perhaps without fully achieving it. And if the American pavilion tries to define the big scale of citizenship, the Estonian installation focuses on the detail. The Estonian narrative rejects monumentality as an imposed history through which citizens do not identify with anymore, encouraging an exploration of new acquired identities that are found and represented in the everyday details of space. These details, which are also celebrated in the Holy See participation, truly encompass the happening of a new sort of citizenship that empowers small histories of power. The details are the small perception of the world that negates the very concept of boundaries. Even the Swiss pavilion demonstrates the importance of the details by neutralizing them. The standardization and an almost obsessed imposition of generalization over details in spaces for its citizens, neutralizes explorations by providing general guidelines in the hope all citizens can identify with dullness. Perhaps, it is the necessity of living the everyday architecture in the daily detail that comes out from this year Biennale. An architecture that is lost in a global context, is now repossessing the scale of detailing, both at the level of construction (the crosses of the Holy See chapels, the pavement in the Estonian installation) and at the level of purposes (the peripheries of the Italian exhibition as the detail of a forgotten space within a grander narrative of cities). On a global scale, questions arise regarding the challenges for architects in articulating FREESPACE through detailing. The attention is now on the details of the new urban space that is now dealing with accommodating people of diverse upbringing and background. Architects has the great opportunity to create the spatial circumstances that allow freedom to people to re-shape their space, while finding new forms of citizenships. In this generous action, architects should strive to maintain the spatial “coincidences and opposites” that can be understood and dealt with, even in the globalized world. “Generosity,” Etymology Online, accessed August 27, 2018, https://www.etymonline.com/word/generous. The European Union was born as an economic cooperation in 1958. However, only in 1993 with the Maastricht Treaty it became a partial political union. “EU treaties,” European Union, accessed September 5, 2018, https://europa.eu/european-union/law/treaties_en. Vittorio Gregotti, “Il problema dell’identità dell’architettura europea e della sua crisi,” Rassegna 76 (1998): 27. Translation by Carla Brisotto. Oswald Mathias Ungers, “L’architettura come autonomia,” Rassegna 76 (1998): 49-50. Ungers, “L’architettura come autonomia,” 50. Zintek company, “Holywood,” leaflet for the installation, n.d., 4. Zintek is an Italian company, based in Porto Marghera, Venice (It. ), that produces the zinc-titanium laminate zintek® for architetcture. The example given is the statue of a kneeling warrior in the city of Torma. Initially, it was settled to face east, toward the Russian regime. After the regime collapsed, it was turned facing west. Later, it was destroyed. The “dancing monument” means a monument used by the political regime to impose a point of view on people using public space. Tadeá Riha, Laura Linsi, and Roland Reemaa, Weak Monument: Architectures beyond the Plinth (London: Park Books, 2018), 10. Riha, Linsi, Reemaa, Weak Monument, 1. 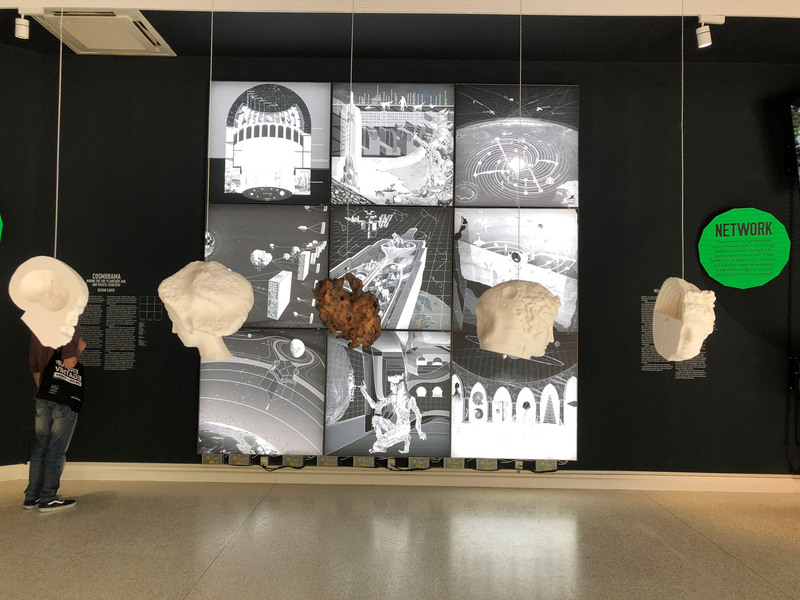 The curators liberally cite the Italian philosopher Gianni Vattimo and his reflections on “the weak thought,” adapting the concept to aspects and issues of space. Riha, Linsi, Reemaa, Weak Monument, 10-11. Hannah Arendt, “The Conquest of Space and the Stature of Man,” in Between Past and Future, (New York: Penguin Books, 1968), 265. Figures 1-7, 9, 11, 13: photos by © Carla Brisotto. Figures 8, 10, 12, 14, 15: photos by © Cristina Murphy. Cristina Murphy is a registered architect in The Netherlands. She started her career at the Office for Metropolitan Architecture in Rotterdam, working on the CCTV-TVCC project in Beijing. 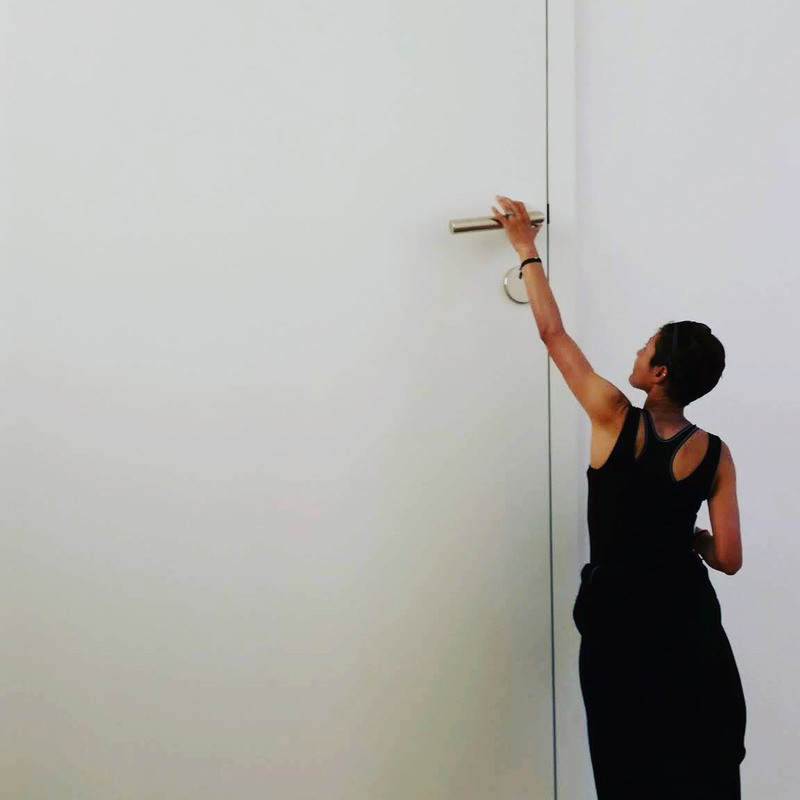 In 2009, Cristina co-founded XCOOP, a think-tank that analyzes contemporary living. Cristina has been teaching architecture and theory throughout the globe and she is presently an Assistant Professor at Morgan State University in Baltimore. After studying at the IUAV and at the Technische Universiteit in Delft (The Netherlands), Cristina earned her master’s degree in architecture at the Columbia University.